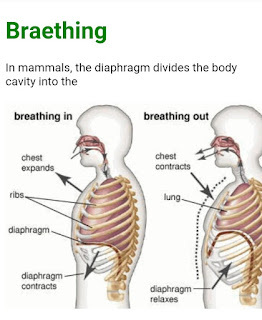 Your respiratory system is made up of the organs in your body that help you to breathe. Remember, that Respiration = Breathing. The goal of breathing is to deliver oxygen to the body and to take away carbon dioxide. The primary function of the respiratory system is to supply the blood with oxygen in order for the blood to deliver oxygen to all parts of the body. The respiratory system does this through breathing. When we breathe, we inhale oxygen and exhale carbon dioxide. This exchange of gases is the respiratory system's means of getting oxygen to the blood.Respiration is achieved through the mouth, nose, trachea, lungs, and diaphragm. Oxygen enters the respiratory system through the mouth and the nose. The oxygen then passes through the larynx (where speech sounds are produced) and the trachea which is a tube that enters the chest cavity. In the chest cavity, the trachea splits into two smaller tubes called the bronchi. Each bronchus then divides again forming the bronchial tubes. thoracic cavity, which contains the heart and lungs. The inner surface of the thoracic cavity and the outer surface of the lungs are lined with pleural membranes which adhere to each other. If air is introduced between them, the adhesion is broken and the natural elasticity of the lung causes it to collapse. This can occur from trauma. And it is sometimes induced deliberately to allow the lung to rest. In either case, reinflation occurs as the air is gradually absorbed by the tissues. The rate of cellular respiration (and hence oxygen consumption and carbon dioxide production) varies with level of activity. Vigorous exercise can increase by 20–25 times the demand of the tissues for oxygen. This is met by increasing the rate and depth of breathing. and the medulla oblongata responds by increasing the number and rate of nerve impulses that control the action of the intercostal muscles and diaphragm. This produces an increase in the rate of lung ventilation, which quickly brings the CO2concentration of the alveolar air, and then of the blood, back to normal levels.